Cara is a National Board Certified Teacher of the Deaf and Hard of Hearing. 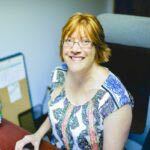 She has taught students who are Deaf and Hard of Hearing for 20 years in a variety of educational settings, as well as serving as an administrator at the district level for a Midlands’ D/HOH program. Unable to accept the status quo with regard to intervention and education of students with a hearing loss, she co-founded Beginnings SC to focus on proactive intervention and parent education and empowerment. When Cara is not working, she spends her time crafting, cooking, and hanging out with her kids.